First Ladies aren’t supposed to raise hell. Especially not widows. 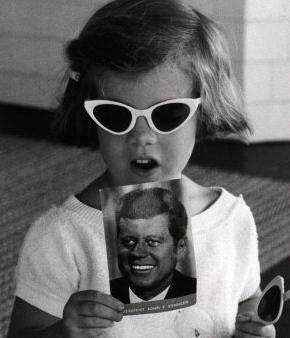 But Jacqueline Kennedy was no ordinary First Lady. When she beckoned William Manchester, her obstinate author, to the Cape that August of 1966, she greeted him with steely determination and in hot pink pants. She had summoned Manchester in the hope of winning him to her side. She knew her charms and was adept at the soft sell. 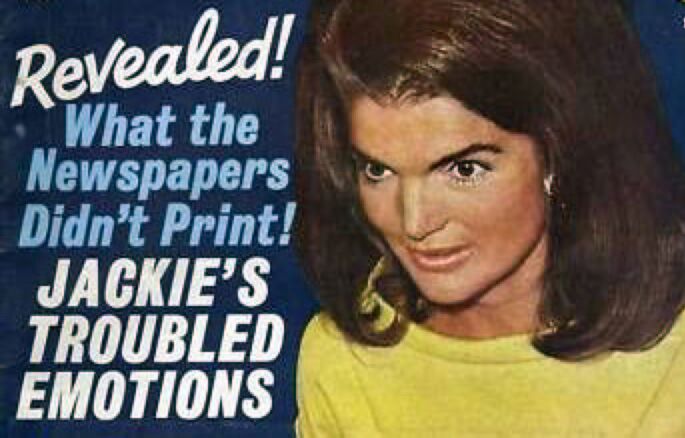 In Jacqueline’s view, if Manchester would agree that there was no genuine Kennedy-approved manuscript, Look magazine would be forced to cancel the serialization. 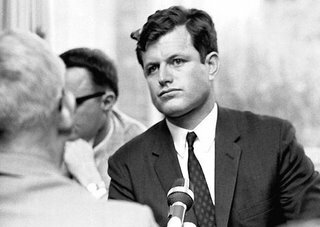 The Kennedy camp, in turn, promised to compensate Manchester with a higher percentage of the royalties. Manchester just didn’t get it. He could not grasp that Jacqueline had wanted a book no one would see. When Richard Goodwin, who was present, promised Death of a President would be published “with dignity,” Jacqueline amended that it would be published without “magazine hoopla and promotion.” Manchester was unmoved. In Jacqueline’s eyes, Manchester had failed. To make matters worse, he had betrayed her trust by including elements of the “frightfully emotional interview[s]” she had given and then denied her the cuts she requested. Suddenly, she had no control of a project that had initially been her’s. the worst thing in my life . . . I’ve never read the book. I did my oral history with him in an evening and alone, and it’s rather hard to stop when the floodgates open. I just talked about private things. 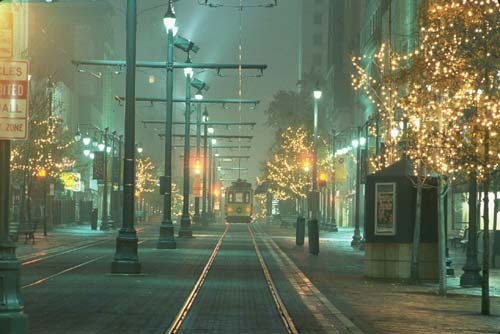 Then the man went away, and I think he was very upset during the writing of the book . . . Now, in hindsight, it seems wrong to have ever done the book at that time. Publicly though, she treated William Manchester with extreme graciousness. Following the legal settlement, Jacqueline Kennedy released a laudatory statement to the press: “I think it is so beautiful what Mr. Manchester did . . . all the pain of the book and now this noble gesture of such generosity, makes the circle come around and close with healing.” A rosy view that wasn’t quite realized. Rather than closing the circle with healing, the Manchester controversy had, in fact, blown it wide open. Just as Robert Kennedy’s attempts to stop the serialization had opened him up to accusations of censorship, so the lawsuit brought the former First Lady under attack in the press, particularly among the tabloids. In assessing the Manchester melodrama, the movie magazines were all over the board in their opinions. If this was to be the press’ first peek at the character “Jackie” was becoming—one who beneath the velvety surface was alarmingly avaricious—the press were not entirely sure what to do with her yet. And they were having a devil of a time assigning blame. 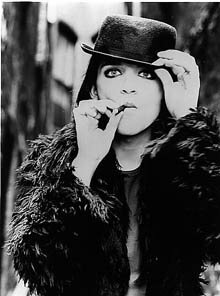 Some said “Jackie” was wronged by Manchester, by Look, by the press, while other publications dismissed her as “The big loser,” a selfish woman who’d pitched a public fit because she hadn’t gotten her way. To the 21st century reader, this is appalling. It’s hard to hold back, to resist the urge to launch into an academic discourse about how, by couching the argument in gender terms, Kesselman perpetuates stereotypes of feminine hysteria and reduces “Jackie’s” violated privacy to a feminine irrationality that would been prevented had a husband been present to calm her down, an assertion that strips “Jackie” of intelligence and reduces her actions to hormonal impulses. And what the women wanted, they got. In the coming years, this is who “Jackie” would become—a hysterical, imbalanced star. She would be put in an unlikely marriage and she would be unhappy. She would fight with her daughter and her husband and his mistress. She would become an insecure shopaholic. She would almost, almost become one of us. If the Manchester dramedy did anything, it was this—it shook up the tabloid formula and steered publishers down an editorial path in which their portrayals would become less positive, in which “Jackie,” the housewifely goddess divine, would be given clay feet. i feel sorry for teddys. i want nothing to do with teddys. teddys are bad, bad news. teddy will be remembered for many, many things, but i think it is quite possibly teddy’s greatest accomplishment that he was able to overcome being a teddy and get something done. it was probably also his greatest sacrifice. there was this moment on the evening january 20, 1961 when, in the grandstands of the national guard armory at his brother’s inaugural ball, the stunning joan kennedy leaned over to her husband teddy and asked if he was serious about moving to california to start a life completely apart from his family and their politics. he was. but he didn’t. i shudder to think what america would be if he had. our graduate school experience was very unique. or at least that’s what we MAPHers tell ourselves. for 9 months, we ran ammuck, dabbling through all the “humanities”- whatever the hell those really are. most graduate programs have 10 people. there were 100 MAPHers. there was The Core. there was always an open bar. but did it we did. and thank God. because had we not, i would never have balanced precariously atop tortoiseshell heels in the middle of the tasting room in a wet pink silk dress and had a most enlightening conversation with sensei. nothing compares to the university of chicago alumni magazine. it’s like an AARP mag edited by louis menand. i had mistakenly believed the highlight of the may/june issue to be the supplemental publication devoted to the “living legacy” of The Core curriculum- a legacy typified by the cover girls, who sit among the stacks of the regenstein library staring at computer screens with what can only be described as expressions of apathetic doom. i laughed and thought, that’s a fan-freaking-tastic summation of u of c life, and went on with my day. i didn’t even bother to check out the actual alumni magazine, CHICAGO. its cover was dominated by an unappealing ed asner clone hunched awkwardly over a hanging file. not exactly gripping so i blithely tossed it into the pile of tabloids and time outs. because of this, i very nearly missed the tiny wonder that lay between pages 8 and 9. the tiny wonder that pointed out as i balanced precariously atop tortoiseshell heels in the middle of the tasting room in a wet pink silk dress. what tiny wonder, you may ask? 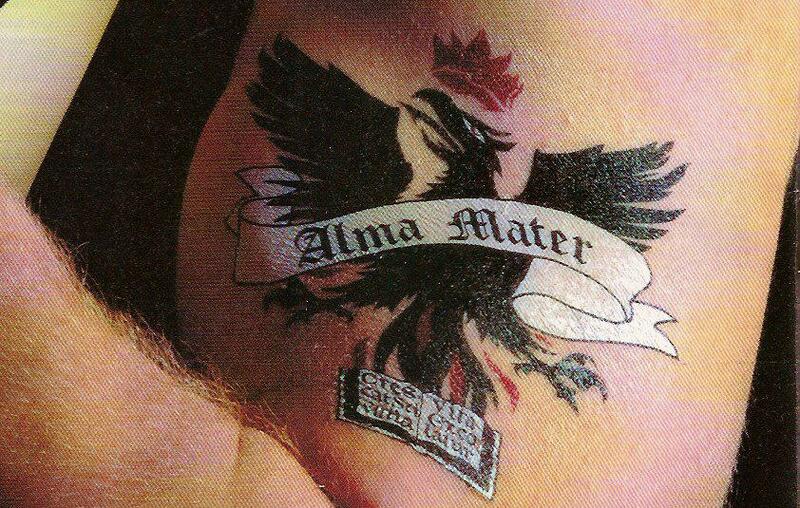 the temporary university of chicago alumni tattoo. because yeah, everyone at the u of c has biceps like that.